Complement your dining room style and keep your serving dishes organized with The District Sideboard. This home furniture piece features a compact tabletop for display and two metal holders to keep towels within reach. 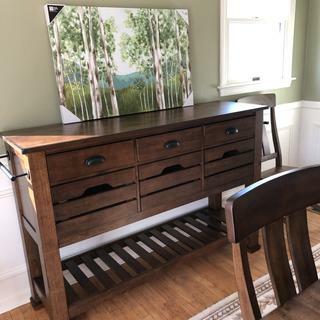 Three felt-lined top drawers with a sleek ball gliding system provide space to store your cherished silverware and three lower drawers provide additional storage space. Show off your wine prowess by displaying the bottles on the bottom shelf. Designed in transitional-style, this sideboard is supported by sturdy block legs. I’m very happy with my purchase of this dining room server. The combination of dark wood with black iron accents is a striking combination. I’m very happy with my purchase of this dining room server. Beautiful adjacent piece to the dining room table.